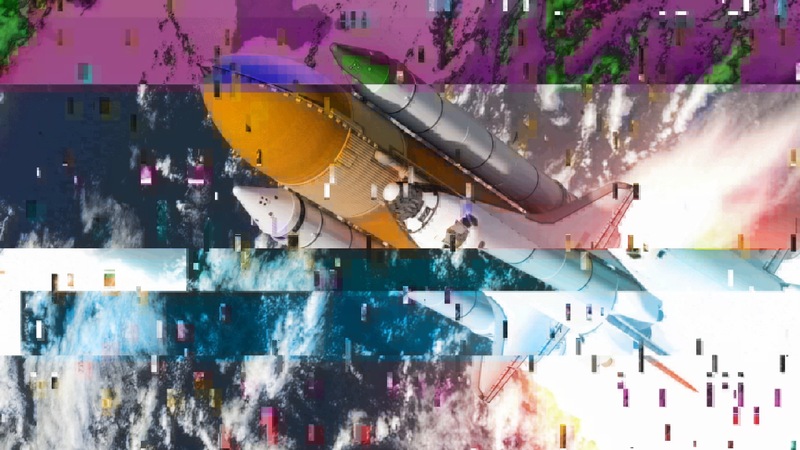 Universe Glitch gives your footage and text the look of compressed, glitched video. This tool creates the effect of poor internet connections, bad video encoding, corrupt data streams, and low-bandwidth broadcasts. Drag the uni.Glitch effect onto your clip. Click the Choose a Preset button to see a preview of all the presets available. Double-click any preset to apply. An important note about working with text layers or shape layers in After Effects: As a general rule most effects don't play all that nicely with text layers or shape layers - especially if they are 3D layers. Because these layers are procedurally generated and have no dimensions, you'll always do best to pre-compose these layers before applying effects and making them 3D. Compression: Creates the look of internet video compression. Higher values remove more and more detail and color and make the image look more and more compressed. Compression Last: By default, compression is applied to the image first. After that, glitches are applied on top of it. The glitches are sharp, bright and colorful, on top of the messy footage. However, if you want to compress the glitches so that they look a lot less defined and mix in with the footage, turning this on applies compression at the end of the effects chain. Glitch Speed: Controls the rate of the glitch animation. Higher values result in faster glitch animations, while lower values slows them down. Glitch Speed Random: Adjusts the % chance that glitch's animation speed varies from one another. Glitch Frequency: Defines the % chance of glitching. At 100%, you will see glitches at virtually every frame of video. At 50% half of all video frames shown will be glitched. At 0%, no glitches will occur. Glitch frequency makes it easier to animate with audio. In After Effects you can use the keyframe assistant called "convert audio to keyframes", or a plug-in like Trapcode Sound Keys which can isolate various bands of audio. The louder the sound, the more glitching you will see. Try linking audio with the "Frequency," "Small Glitches," and "Wide Glitches" properties for a really nice effect. If you are not working in AE, you can just animate Frequency by hand with keyframes for a great effect. Controls the number of small Glitches on the screen. Higher numbers create more glitches. SG - Blending Mode: Choose a blending mode for the glitches. This is especially helpful in making the glitches more visible for different kinds of footage. Brighter footage might do better with the Difference mode, whereas white Text might look best with the Normal mode. It all depends on the footage. SG - Saturation: Controls how saturated the glitch color is. Lower numbers remove more and more color from the glitch, and depending on your setting, from the footage as well. With some blending modes, you might not see much of a difference after dialing up past 15, but depending on your setting for SG-Blending mode, higher numbers can give you some interesting and unexpected results. SG - Complexity: Determines how complex the shapes off the glitches can be. Lower numbers give you more regularly squared or rectangular images. Higher numbers give you results that break up the glitches a little more and make their blockiness a little more random looking. SG - Size: Controls the size of the glitches. Higher numbers make bigger glitches by zooming in on the effect. If you want big glitches to fill up the screen, you'll also need to turn up the Small Glitches amount. SG - Aspect: Controls the aspect ratio (or width) of the small glitches. A value of one creates square glitches. A value above 1 creates glitches that are more rectangular in shape. Values below 1 make glitches that are tall and thin. SG - Pattern Size: Controls the size of the color/displacement pattern in the glitches. Higher numbers make the pattern bigger by zooming in on the effect. SG - Pattern Aspect: Controls the aspect ratio (or width) of the color/displacement pattern for the small glitches. A value of one creates a more square-like color pattern. A value above 1 creates a pattern with color chunks more rectangular in shape. Values below 1 make a pattern with chunks that are tall and thin. SG - Displacement X: Controls displacement on the X Axis. Pixels that are glitched will be moved left or right. Higher numbers means more pixel displacement. SG - Displacement Y: Controls displacement on the Y Axis. Pixels that are glitched will be moved up or down. Higher numbers means more pixel displacement. Controls the likelihood of wide glitches appearing. Higher numbers mean Wide glitches are more likely to appear. WG - Height: Controls the height of the area being glitched by wide glitches. WG - Blending Mode: Choose a blending mode for the glitches. This is especially helpful in making the glitches more visible for different kinds of footage. Brighter footage might do better with the Exclusion mode, whereas white text might look best with the Normal mode. It all depends on the footage. WG - Saturation: Controls how saturated the glitch color is. Lower numbers remove more and more color from the glitch, and depending on your setting, from the footage as well. With some blending modes, you might not see much of a difference after dialing up past 15, but depending on your setting for SG-Blending mode, higher numbers can give you some interesting and unexpected results. WG - Difference Glitches: When turned on, this control give you a second level of Wide Glitching using the Difference blending mode. WG - Pattern Size: This controls how tall the wide glitch stripes are within the area of the wide glitches. This pattern will affect the brightness of the glitch color on the footage, as well as the displacement. Higher values yield taller stripes, which means less complex color and displacement. WG - Color Displacement: This controls whether or not pixels under the Wide Glitches will be displaced. WG - Difference Displacement: This controls whether or not pixels under the Difference Glitches will be displaced. WG - Displacement X: Controls displacement on the X Axis. Pixels that are glitched will be moved left or right. Higher numbers means more pixel displacement. WG - Displacement Y: Controls displacement on the Y Axis. Pixels that are glitched will be moved up or down. Higher numbers means more pixel displacement.